Karacosis wutansis (also called the Wu flower) is a hybrid genus and species of flowering plant. It was first cultivated by Dr. Henry Wu and colleagues at International Genetic Technologies, Inc. in May 1997 after four years of research and was the first known hybrid genus of organism to be engineered. It was presented to the International Society of Geneticists and by May 21 its scientific name was in the process of being finalized. The scientific name was not selected by Dr. Wu himself, but rather by the International Society of Geneticists in honor of him. While the genetic makeup of this hybrid is unknown (sources simply claim it includes genes from “several” plant species), it is credited with revolutionizing the field of genetics and attracting the interest of Simon Masrani, CEO of Masrani Global Corporation, to buying InGen. Because it is a flowering plant, at least one of its genetic sources must have been an angiosperm (Magnoliophyta). Presently, all that is known about K. wutansis is that it is a flowering plant which was engineered by hybridizing DNA from several naturally-occurring plant species in the laboratory. Its size and anatomy are mostly unknown. Flowers are reproductive structures and contain sporangia; after fertilization, they develop into fruit containing seeds. In nature, many flowers have evolved to appear attractive to animals in order to draw in pollinators, but it is not known how Wu and associates modified the appearance of this particular species. The growth pattern of this genus is unknown, but its growth rate is reasonably rapid. It was first engineered in May of 1997, and by May 21 was presented to the International Society of Geneticists and was given a binomial name, meaning it was recognized as a unique genus and species. This suggests that it grows from seed to maturity in, at most, roughly three weeks. Flowers can be either “perfect” or “imperfect,” depending on whether they have one or both types of reproductive organs. A “perfect” flower, or “complete” flower, contains both, and its species is said to be hermaphroditic. Meanwhile, an “imperfect” or “incomplete” flower has only the stamen or carpel, and is said to be unisexual or unisex. Most unisex flowering plants are monoecious, meaning that the staminate (“male”) and carpellate (“female”) flowers are found on the same plant. However, some are dioecious, meaning that these different reproductive types are found on different plants. The configuration found in K. wutansis is unknown. Flowering plants can grow in a wide range of climate types, but as Dr. Wu reported out of the Central Time Zone on May 21 about K. wutansis, he was most likely working at an InGen facility in San José, Costa Rica rather than the San Diego, California location. The plant may have been adapted to the local environment; alternatively, Dr. Wu and associates may have engineered it for a different environment type to prevent it from accidentally spreading into the wild. It is unknown whether InGen brought any samples of K. wutansis to Isla Nublar, though it is known that they cultivated many types of modern and de-extinct plants on the island between 2004 and 2015. If any were living on the island after 2015, they likely became extinct on or after June 23, 2018 during a volcanic eruption of Mount Sibo. 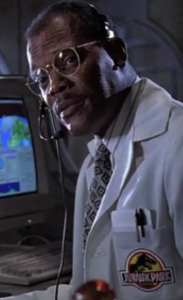 There is no evidence that K. wutansis was ever introduced to Isla Sorna. At the date it was formally named on May 21, 1997, Isla Sorna had been almost untouched for four years, though the 1997 Isla Sorna incident beginning two days later would result in the island becoming used for genetic research again. The first K. wutansis was created in May of 1997 by Dr. Henry Wu et al. at a currently unknown InGen facility. On May 21, Dr. Wu logged his success in the InGen database with a timestamp reading 0745 CST, meaning he was in the Central Time Zone on that date; InGen facilities in the Central Time Zone include those in Costa Rica. As the Isla Nublar location was abandoned at the time, the only location Dr. Wu could have been working at would be in San José. The majority of flowering plants are active during the day, using sunlight as a catalyst for the process of photosynthesis. At night, their activity slows down. In most flowering plants, the leaves are used to take in sunlight, carbon dioxide, and water, which are used to produce sugars. The roots are often also used to take in nutrients and water. Oxygen is produced as a waste product. However, some flowering plants are carnivorous or parasitic, and many plants use symbiotic fungi or microorganisms to obtain more nutrients. Many plant species grow in groups and have simple forms of communication. It is not known if individual K. wutansis plants have relationships with one another. Flowers are the reproductive structures of angiosperm plants. They may contain a “male” structure called an androecium, which consists of organs called stamens. The end of the stamen, called an anther, produces pollen that is dispersed either by wind or by pollinating animals. In many cases, flowers are evolved to attract particular animals to pollinate them. A flower also can contain a “female” structure called a gynoecium, or pistil, which consists of organs called carpels. The carpels form a hollow ovary that produces egg cells. The pollen is delivered here to fertilize the flower and begin the fruiting process. The fertilized flower develops into a fruit, which contains seeds that will grow into new plants. In some flowering plants, both the “male” and “female” reproductive structures are present in the same flower, while in others, a flower will have only one or the other. A single plant may bear flowers of both sexes or of only one. Many types of plants can communicate with one another using networks of symbiotic fungi which live in and around their roots, as well as using chemical signals dispersed through the air, water, or the ground. It is likely that K. wutansis would possess such traits, though specific details have not been disclosed. Karacosis wutansis is an artificial hybrid with no natural ecology. However, as a flowering plant, it may need pollination in order to reproduce, though what animals would be sufficient pollinators would depend entirely on what species were sourced to influence its morphology. It is also not known what kinds of animals may feed upon it, or what defenses it would employ to deter herbivores. Karacosis is the first hybrid genus to be engineered intentionally by humans under laboratory conditions, and its sole species, K. wutansis, is likewise the first species to be engineered in such a way. As of May 21, 1997, it was being formally named by the International Society of Geneticists, meaning it was scientifically recognized as a legitimate genus and species. It was genetically engineered by revolutionary American geneticist Dr. Henry Wu, who was at the time employed by International Genetic Technologies, Inc. He had worked for the past four years on creating a viable hybrid genus; his ambitions were described in his 1995 book, The Next Step: An Evolution of God’s Concepts, and many (including Wu himself) considered K. wutansis to be a realization of the techniques conceptualized in his book. The creation of K. wutansis gained international media attention, though former InGen CEO John Hammond could not attend the meeting of the International Society of Geneticists due to his failing health. Despite the San Diego incident occurring four days after the Society formally named the Wu flower, it captured the attention of Indian tech mogul Simon Masrani, a friend of Hammond’s. As a result, Masrani Global Corporation began bidding on InGen after the fallout of the San Diego incident and finalized the merger in 1998. While Wu had been using hybridization as a form of genetic engineering since the mid-1980s, the creation of K. wutansis would open up a new field. Rather than using hybridization to alter or enhance an existing genus or species, he demonstrated that entirely new ones could be created. His work would come to a head between 2008 and 2012 with the creation of the species Indominus rex, a complex hybrid animal including genes sourced from at least twelve different animal species. From this point onward, the synthesis of entirely new genera of living thing was a firmly established scientific possibility, and Wu would continue research into it for the remainder of his career. From left to right: Lilium candidum, Nelumbo nucifera, Galanthus nivalis. While the appearance of Karacosis wutansis is not currently known, these flowering plants provide examples of what it may resemble.